We have been committed recently to running some tests on single serve coffee machines. Our aim is to bring you impartial advice on some of the options out there which will help you to make an informed decision about which machine is the best fit for you. 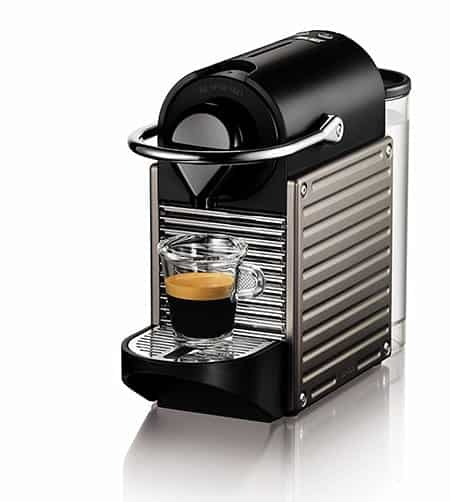 Of course, we couldn’t review coffee machines without trying a Nespresso machine! We tested their latest offering, the Nespresso Pixie to see how it faired against other market leaders. How well Does the Machine Work? Who is the Pixie Best Suited to? Who is the Pixie Not Best Suited to? Thermoblock heating technology: The heating system in the Nespresso Pixie means your water is heated within twenty five to thirty seconds of switching the machine on. The folding drip tray allows you to choose the best position to suit the cup you are using. Two sizes: Espresso and lungo. Programmable settings: You can enhance your experience by tweaking the settings to perfectly match your personal taste. Large water tank: The water tank holds 240z of water and is removable for easy cleaning and refilling. Comes with an inbuilt used capsule container which holds up to ten capsules meaning you aren’t constantly trailing between your machine and your bin. LED indicators: The indicators show when the water tank is empty. The buttons are also backlit, meaning the it is easier than ever to see the buttons clearly and this reduces the risk of hitting the wrong button. 19 bar pump: This high pressure pump means the brewing process is just right for the perfect extraction. This leads to an intense flavour and also produces the right consistency of crema. Automatic power of function: The machine will automatically switch off nine minutes after use. This is a great power saving tool if you regularly forget to turn your machine off! This compact little machine is pretty easy to use. The capsules are easy enough to insert and remove. Reprogramming the buttons is an easy process and it’s very convenient being able to save your own personal preferences. To make your coffee, simply insert your capsule and choose whether you would like an espresso (an intense shot of coffee) or a lungo (a slightly longer drink). You can then add your milk and sugar to taste. The water tank heats up quickly and provides a hot enough, but not too hot, steady stream. The pump really does make a difference too to the body of the coffee. Although Nespresso have always recommended using their branded capsules, with the Pixie, they have ensured that only their own brand capsules will work. Not great if you don’t like their blends, and the capsules are pretty expensive, working out at 70c per cup. This machine is quite expensive compared to similar models. However, it is well made and sturdy. A little bonus tip: If you are more of an Americano drinker, select the espresso setting and brew the coffee. Without changing the capsule, continue to brew espressos, which will pull plain water through the now empty capsule. Repeat this process until you have the volume you require. The Nespresso Pixie is ideal for anyone who wants a pod or capsule machine with a wide choice of flavours available. The Nespresso capsule range is impressive with something to suit every taste. The fast brewing process makes this machine ideal for families as there’s no waiting around between cups. If you don’t like the taste of Nespresso coffee, steer clear of this machine as you are now beholden to use them. This machine isn’t the best choice for anyone on a tight budget either, as although it does have some great features, it doesn’t really warrant the price tag. The Nespresso Pixie, the latest addition to the Nespresso coffee maker family, is a great little compact machine that’s perfect for smaller spaces. It works well, and offers a good range of different brews and flavors. Not a bad choice! The Nespresso Pixie, the latest addition to the Nespresso coffee maker family, is a great little compact machine that’s perfect for smaller spaces. It works well and offers a good range of different brews and flavors. Not a bad choice!